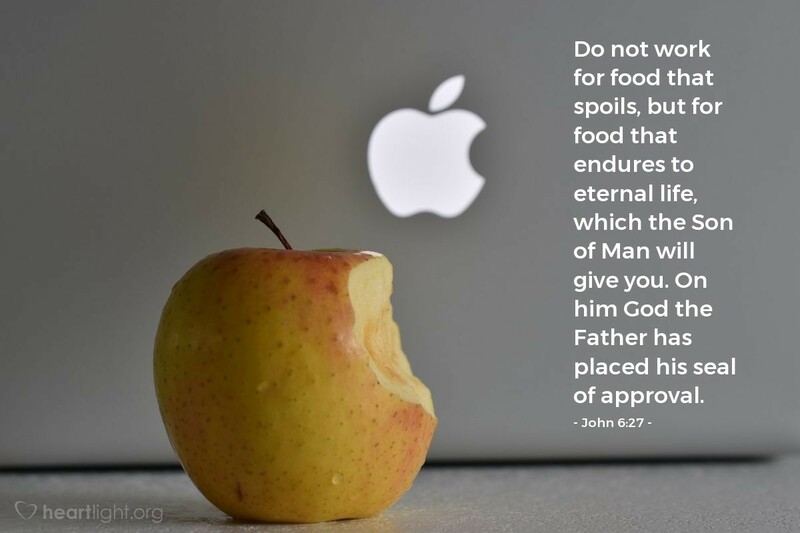 Do not work for food that spoils, but for food that endures to eternal life, which the Son of Man will give you. On him God the Father has placed his seal of approval. What are you spending the biggest bulk of your life working for? Is it a boss, a promotion, a sense of importance, a secure lifestyle ...? If it can be taken from you, or you can be removed from it, then it's not very permanent is it! Only what Jesus gives us is truly lasting, and it comes from God's grace. So how can you more fully invest yourself in work that "endures to eternal life"? Un-cloud my thinking, dear God, so that I may more clearly see what it is that I'm working for in my life. Help me find ways to invest myself, "my" time, and "my" money in those things that are eternal. But, dear Father, I must confess that I will need your help to find my significance in my relationship with you and not in what I do, produce, and accomplish. Please forgive and strengthen me as I commit to seek you above all other things. In the name of Jesus, your Son and my Savior, I pray. Amen.